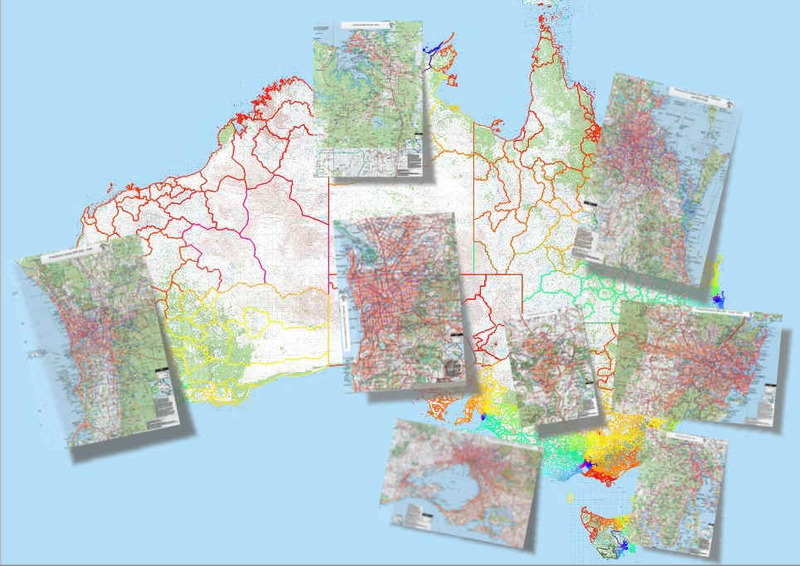 Our Australian Postcode Map Series and Australian Postcode Map Series Pro are presented in Adobe .PDF format. Interactive search by Postcode, suburbs and towns. All you need is Adobe Acrobat Reader, or an equivalent application to use your maps. The product series is available for each State / Territory of Australia, for each major metropolitan capital city, and as a discounted compilation for our whole nation. Click here to see an actual size screen shot sample. Compare the prices for our up-to-date searchable map products with other suppliers, who use obsolete postcode boundaries and often resort to an old fashioned, hard to read index to find the information you need. Compare our products on a like for like basis e.g. these from Cartodraft and we’re sure you’ll find ours to be the best choice. Small Business, Small Business Limited, or Organisational Licence? Our digital data and map products are licensed, not sold. As such, they are subject to an End User License Agreement (EULA). It doesn’t matter that only a small team or individual may be directly engaging with the product(s) – benefits flow to an organisation as a whole; the only considerations are the size of the Licensing organisation and intended mode of deployment. If unsure what License level should apply, please seek advice from management within your organisation. If there are fewer than 100 employees, you can choose either the..
Small Business License (100 employees or fewer), unrestricted use on stand-alone computers / devices within your Small Business, or..
Small Business – Limited License (100 employees or fewer), restricted to installation on not more than three computers / devices. Or if there are more than 100 employees or you wish to deploy from a central database over intranet / Internet, you need the..
Organisational License (more than 100 employees, a Franchise, or where the product or derivatives are to be made available via Internet or Intranet). Unrestricted use within your organisation. Our License structure is designed to provide optimum deployment flexibility within your named organisation. If you believe none of our standard Licensing options meet your own particular circumstances, please e-mail Sales, with a brief explanation of your situation and we will endeavour to assist. In the PDF product series, can I search only for postcode values, or can I look for suburbs and other places? You can search for both kinds of information. The flexibility of the search process is determined by the application you use to read the document. For example Acrobat Reader allows basic searching, and also has a number of advanced search options. Best to experiment and see what works for the kind of search you require. Can you explain the difference between your postcode map series product and the GIS data product? The Postcode Map Product is a PDF document designed to allow access to postcode area information, but without the requirement of specialised software. It can be utilised in Adobe Acrobat Reader, which is free. It is ideal for interactive use, for example manual allocation of sales territories. The GIS Data Product is the same postcode area information, but requires a GIS application to use it. If you require a more interactive and analytical approach, this will be the best choice for you, but please study the information in the link provided. The following two questions may also be of interest to you. If you are unsure of the best choice, it may be a good idea to print a copy of these few questions and answers (select the text of interest with your mouse and use your browsers print command, checking the “selection” button) and further discuss your Postcode map requirements with your colleagues. Are the maps available as paper wall maps? A paper map is less useful than an electronic map as searches must be done manually. Also it is necessary to include a keyed index to allow manual searches on a paper map, which takes up a lot of space. The space saved in our products allows us to use highly detailed inset maps for major urban areas. Most of our products are in digital form, with the exception of the Paper Australian Postcode Map products. If you wish to have a paper copy of your Map Series product, you can take the PDF version (on a memory stick for example) to your local printer, and print off a copy. A large national office company offers this service for an A0 poster for around $30 for example. Also, we update our postcodes frequently. Digital maps can incorporate such updates rapidly and efficiently, and we have an Update Service available to allow you to take advantage of regular updates to our products. If we had printed paper maps, they would become out-of-date quickly. As a potential customer, we don’t think you would be very happy about that! Can I print the Map Series out myself then? The Map Series is optimised for information searching within a PDF software application. 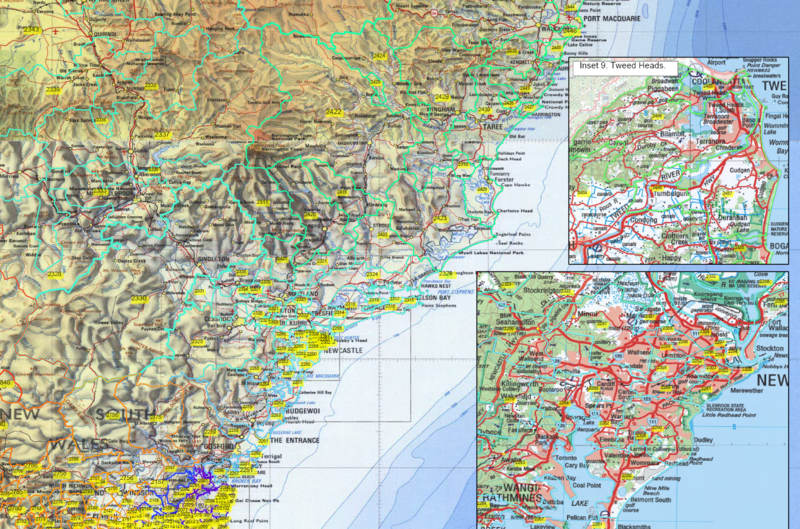 You could ask a commercial printer to run off a paper copy from your Map Series PDF file. The best choice for this specific objective would be the High Resolution version of the Map Series Pro product. Often, users are interested in smaller areas of the overall map, and use the keyboard’s “print screen” button to copy the area of interest shown in the PDF reader application. The resulting clipboard image can then be pasted into a new document or graphics application, and sent to the local office printer. I've found some paper maps and a postcode mapping CD on the Internet and they seem cheaper than yours. Why should I buy your products instead of these cheaper ones? Some postcode mapping products based on open source (essentially “free”) software were available in the past. In our experience the postcodes included in such products were simply not up to date, despite suggestions to the contrary. Such products have not been available since 2012. For serious work, get a real GIS and accurate, up-to-date postcode area data – you’re now in the only place where that is available! 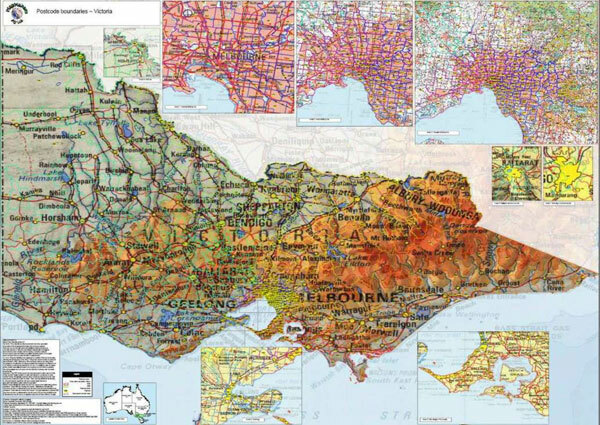 MapMakers introduced a range of Paper Australian Postcode Maps in October 2013. If you’re interested in paper maps from other suppliers, you will find they probably do not include enough printed detail to allow you to see postcodes in urban areas. 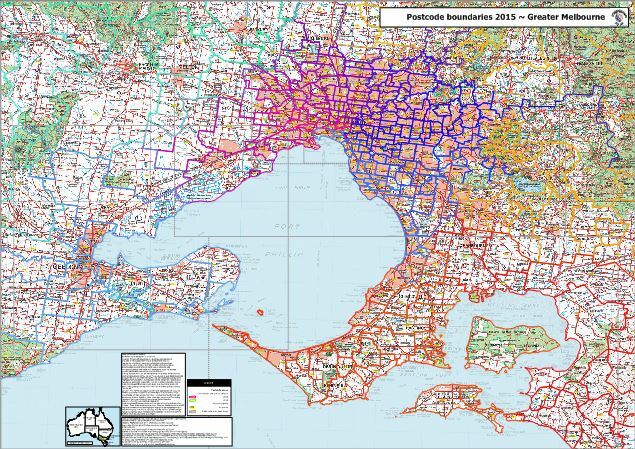 It is likely that you will have to buy several additional maps if you are interested in postcodes for a whole state, if indeed they are available at all. That probably means you will end up paying more for paper maps than for our digital maps, and of course searching is a manual process with a paper map. It is also likely that a paper postcode map will be even more out-of-date than anything on disc, whereas our digital Postcode data and maps are updated frequently. We once had a paper wall map of postcodes which cost $25 from memory, but I can't find them anywhere. These were produced about twenty five years ago by the Commonwealth mapping department and Australia Post. Postcode area information is no longer available from these agencies. Costs were subsidised by the tax payer and a large printing run allowed the selling price to be set artificially low. However most were never sold, so the actual cost per copy sold was enormous. You could try looking on the Internet auction sites, but even if you find one, it will be hopelessly out of date. 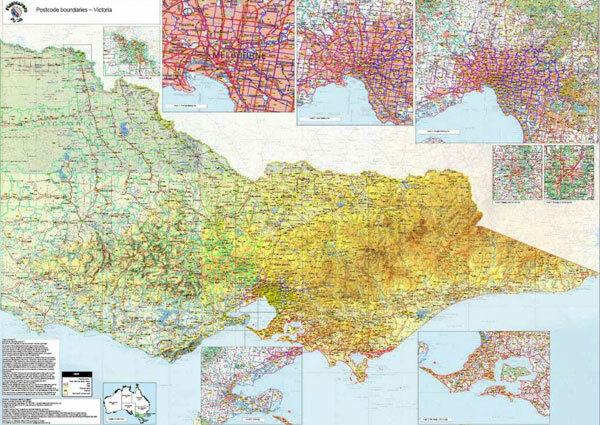 Our own paper Australian Postcode Maps – paper A0 or B0 sizes, were introduced in October 2013. Can I overlay other information, like map pin symbols representing customers, on your maps? The PDF maps could be used in this way, but it would require you to have a software application which provided this functionality (that is, an application which allows editing of PDF documents). For users with sophisticated or value added requirements, it may be worth considering the GIS data version. You will also need a GIS application to make use of it. Can I use different colours to differentiate groups of postcodes we want to consider together? The most effective way to do this is by using a GIS software application, especially if your requirements are complex and / or extensive. However if you wish to do this manually (for whatever reason! ), it is possible to do so using Google Earth (which is free) and our Data Series products in KML format. However, if you want to approach such a task in the way it was done before the digital age, you could print a hard copy of your Map Series product, get out your highlighters and crayons and set to work! Tech tip: Get your hard copy laminated, makes it a bit easier if you change your mind! How current is the postcode information on your maps? Up to date for 2019. These products are validated against the definitive Australia Post database. Our digital data and map products are licensed, not sold. As such, they are subject to an End User Licence Agreement (EULA). It doesn’t matter that only a small team or individual may be directly engaging with the product(s) – benefits flow to an organisation as a whole; the only considerations are the size of the Licensing organisation and intended mode of deployment. If unsure what Licence level should apply, please seek advice from management within your organisation. Small Business Licence (100 employees or fewer), unrestricted use on stand-alone computers / devices within your Small Business, or..
Organisational Licence (more than 100 employees, a Franchise, or where the product or derivatives are to be made available via Internet or Intranet). Unrestricted use within your organisation. Our Licence structure is designed to provide optimum deployment flexibility within your named organisation. If you believe none of our standard Licensing options meet your own particular circumstances, please e-mail Sales, with a brief explanation of your situation and we will endeavour to assist. This version deploys a 1:5 million scale background image for the main map, plus a combination of 1:1 million and 1:250,000 scale background images for the inset maps. This combination facilitates clarity of major towns and geographic features in the background maps, whilst keeping file sizes small enough for fast display and searching even on older laptop and office machines. The High Resolution version uses a 1:1 million scale background image for the main map plus a combination of 1:250,000 and 1:1 million scale images for the detailed inset maps. It provides much more detail in the main map background than the Low Resolution version, but still keeps file size small enough for acceptable display and search speeds on older computers. Display and search on well-specified modern machines is very fast. For users who wish to print a paper copy, this would be the version to use. Full product lists are available in the site store for both the State Map Series, and for the City Map Series. A small PayPal service charge is included in the final checkout price for this option. For us to invoice you directly (eliminating the PayPal service fee), simply e-mail us including the product ID of the product(s) you require. Please include your shipping address and ABN when you e-mail an order, this will speed up the order process significantly. If you are ordering a GIS Data product, please specify your required format (if you are unsure, tell us which GIS software you will be using and we will select an appropriate format. We will advise you of our recommendation for your review and approval, prior to processing your order). If you are ordering GIS Data products using PayPal, we will communicate with you via e-mail to select your preferred format. Our Postcode Map Series, Data Products and derivatives including tabular output, require pre-payment. Once your order has been received, we will return a Tax Invoice to you, including our bank details for electronic funds transfer. If you are using the PayPal shopping cart, the process is automated – simply follow the instructions through the shopping process, to final checkout. In either case, your product will normally ship the same business day, meaning you will typically receive it within one or two business days of ordering. Your products are protected by an encryption key: As soon as your funds appear in either our bank or PayPal accounts, you will receive your password via e-mail. You will be asked to enter your password during the product installation process. Please keep your password safe! For purchasing and licensing purposes, an organisation is defined by it’s possession of a unique ABN (Australian Business Number) or other relevant national business registration number. For example if a State Government were to purchase a product for broad use, each State Agency, identified by it’s use of a unique ABN, in which the product were to be used would need to purchase the product separately. The distinction between Small Business and Organisational Licence versions is based on number of employees. The Small Business License requires 100 employees or fewer. The Small Business Limited License restricts installation to three devices. The Organisational License is for businesses with more than 100 employees.